Larger Gaps Lets Water Flow Freely Design and create a unique driveways, walkways, or patios with EPA & TRPA approved pervious concrete. This green building practice builds driveways, parking lots, and walkways throughout the country. Tahoe Basin and Reno use this to restore groundwater supplies. To reduces total runoff. This also increases the amount of filtered groundwater. Using this drainage system in parking lots saves the expense of having to tie into local sewers. This system provides both day to day mitigation as well as catastrophic containment. 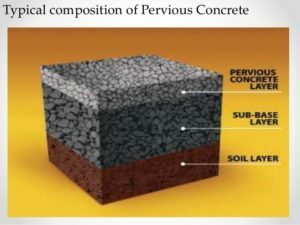 In the Pacific northwest pervious concrete pavement reduces total runoff. This also increases the amount of filtered groundwater. Using this drainage system in parking lots saves the expense of having to tie into local sewers. This system provides both day to day mitigation as well as catastrophic containment. Winters in Incline Village and North Lake Tahoe usually mean snow. Installing pervious concrete melts ice and snow faster while reducing refreezing. Air circulates through the gaps making the snow melt faster. to refreeze like on asphalt and traditional concrete. Durability and drainage capabilities create a longer life span than asphalt. The drainage eliminates drainage pools or water runoff collection points on your property. 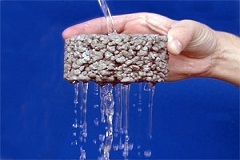 The EPA has listed pervious concrete as a Best Management Practice. This is due to its low life cycle cost. This concrete is made on site and can be recycled after it has reached the end of its life cycle. The high EPA ranking means the Tahoe Regional Planning Agency will allow Tahoe homeowners to cover up to 25% more of their land if they use pervious concrete. Yes, we can heat pervious using our heated driveway systems. 1. Demolition: If there is a preexisting asphalt or traditional concrete driveway we will remove it and haul it away. 2. Excavation: We will need to excavate at least 12” below the grade in order to make room for the sub-base and the pervious concrete. Depth may vary due to situation. 3. Substrate: We level and lay down a larger porous rock that naturally redistributes the water once it has passed through the concrete into the natural water-table. 4. Pouring Concrete: The concrete is mixed on site in a truck or mixer. Screened and vibrated to level. Plastic is then placed over the slab for a one (1) week curing time.